The Wilmington Star-News lays it on the line today in its criticism of the North Carolina Policy Collaboratory, a legislative-inspired environmental think tank to be housed at UNC-Chapel Hill. ….it was created in this year’s budget to provide research into natural resource management and new technology to make the Tar Heel environment nicer. It’s also supposed to advise the General Assembly. The legislature ponied up $1 million for the project for the next two years. The university system, apparently, is expected to come up with up to $3.5 million more from, well, somewhere. Now, for professors, a brand new, shiny research institute is like a brand new video game for Christmas. Over in Chapel Hill, however, faculty member are dubious. UNC System President Margaret Spellings and Jeffrey Warren, Sen. Phil Berger science and energy advisor. Why? Well, staffing of the Collaboratory is still supposedly up in the air, but word is, the new director is going to be Jeff Warren. Warren was science adviser to state Senate Republican leader Phil Berger. He was credited with writing the 2012 law that forbade state agencies from taking note of scientists’ predictions of sea level rise when drawing up coastal policy. Berger, it happens, was one of the major sponsors of the Collaboratory concept. He’s gone on record as saying that the universities are all out of whack, with Democrats outnumbering Republicans by a 12-to-1 margin among faculty. The suspicion is — and it’s a good one — that the Collaboratory will eventually turn into a think tank of tame scientists, who will come up with rigamarole to justify anything the Republicans in the legislature feel like doing. Offshore drilling is good for fish and little children? Sure. Sea turtles spread the Zika virus? Durn straight. Let them bulldozers roll! And the taxpayers will foot the bill. The trouble is, scientists might be a bunch of wooly-headed liberals, but they also have this annoying habit of being right. Sea levels have been rising pretty much as Duke’s Orrin Pilkey said they would a quarter century ago. Doctors said cigarette smoking caused lung cancer and heart disease. That was bad news for North Carolina’s tobacco industry, but as more folks quit smoking, tobacco-related lung cancer and heart disease rates plummeted. Many politicians seem to think that reality is consensual. If your craven opponents say X equals Y, you find your own bunch of mouthpieces, label them experts and have them declare that, no, X equals Z. These days, that’s a good way to win an election, but can be costly to make government policy this way. We need facts, genuinely unbiased facts. This Collaboratory will be a major test for the new UNC president, Margaret Spellings. Let’s hope she gets it right. 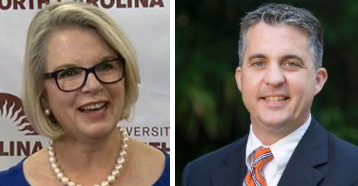 Learn more about the man expected to head-up the North Carolina Policy Collaboratory in this piece by NC Policy Watch’s Lisa Sorg. Read the full editorial here in the Wilmington Star-News. A republican think tank?..hmmmm..heheh…heeheheh..hahahhahaahaha..More like a stink tank of arse gas and BS…More like a fact free zone….No thinking caps allowed…..